Wow! that was Hot, Humid and at the same time a great experience! The past 2 marathons have been a disappointment because of the weather! so, my performance has not been good. I often tell my friends and running partners that my kryptonite is the heat and humidity mix. That is definitely the worst running conditions for myself! On the other hand, I had a great weekend with my wife! We drove to Houston on Friday after I got out from work and we had a good drive. We even stopped at Bucee’s to get some popcorn and drinks. We arrived to Houston right after the basketball game, which had us in a parking lot of traffic just a block from the Hilton of the Americas where we stayed at. We checked in and went up to the room that Friday night. I had to do a bit of work and after watching some show on T.V. we went to sleep. I got up early in the morning to start working, I was working the Simulcast 2017 event which is a show AmbitEnergy events team puts together every year for our consultants. This year I had my team do hands on work the backend of the show, I was directing them which meant I had to work on making sure everything went ok. Thankfully, everything went well with a minor hic-up not on our end. I took work to get breakfast sometime that morning. During my breakfast, I talk to our waiter which whom is from the the same area in Mexico as me. So after chatting I was talking to my wife about me going to get my packet at the expo and I wanted to get a post it note on my card access key with the room number. So, I reached to my pants to grab it and in the process of me handing it to her. I saw my picture was on my access key!!! I was so surprised! I thought to my self ! !it’s nice they personalized my key!! so, we shared some laughs and then I received text messages from other friends in Houston. Morna an Irving Running Club member and committee member runner saw me in the full page program for the Houston marathon. Then, other friends posted their finding on Facebook, saying I was a celebrity/famous. This is when all began! My weekend as a celebrity! every where I went I was reminded of my celebrity status that weekend. 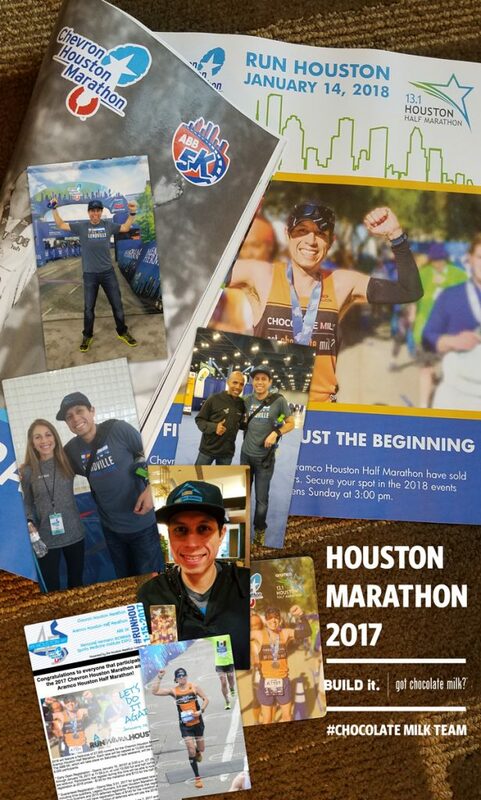 During the Marathon, I wore my Team Chocolate Milk jersey and for my surprise I was cheered at the whole 26.2 miles “Go, Go, GO…Chocolate Milk” ….. which I loved and maintained my cool by smiling and shouting Woooohooooo!!! and arms up! This whole weekend was just amazing! I decided to take the marathon run as a practice one because of the weather conditions and achieving a 3:18 time. I am back in training and I just had to say! what a weekend that was!. Thanks to all the people who came out to cheer for the runners, thank you Team Chocolate Milk for your support, thanks to my wife for being awesome at every event and thank you God for giving me the opportunity and being on my side the whole way through!